I love meetings. When the right people are in the room, with a clear agenda and desire to work together towards a common goal, magic can happen. Ideas are put out there and refined as a group, and an action plan is developed, with next steps and clear accountability. They end 5 minutes early and everyone leaves ready to tackle big problems. Of course, this rarely happens. We spend a ridiculous amount of time in meetings that meander through a rough (or non-existent) agenda, no direction given nor accountability assigned, and then we depart to the next meeting feeling demoralized. I am an employee at a public University. My colleagues and I have a responsibility to not spend taxpayer money and students’ tuition and fees inappropriately. I wanted a way to display a rough estimate of the cost of a meeting, to help remind us to keep focus and make progress. New Jersey, with its strong freedom of information law (the Open Public Records Act, or OPRA) has salary information for all State Agency and Authority employees that is available on YourMoney.nj.gov. Also available are records containing information on those non-State Government employees contributing to public retirement systems, such as local government employees and educators. I have compiled this information and built a clock that will track time in dollars, based on the members in the meeting. 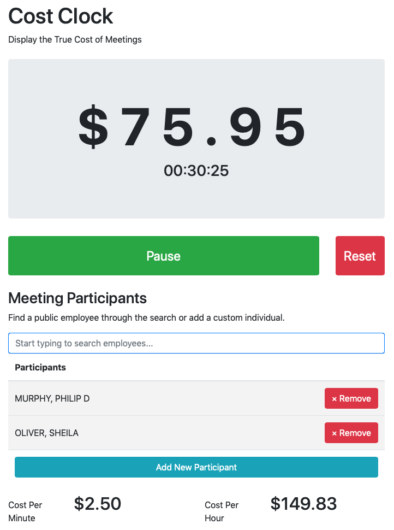 CostClock.com will allow you track a meetings cost based on the participants in the meeting. You can quickly add individuals from a list of public employees. If you are tracking a meeting of individuals not in the list of public employees, simply click “Add New Participant” and enter the person’s name (or title) along with annual salary or hourly rate. As it is a clock, the amount and time are displayed prominently at the top of the page. I also wanted to reduce the navel-gazing that may be introduced with showing annual salaries, so only the total cost of the participants is displayed, per minute and per hour. And while I’ve been mentioning the dollar amount as a “cost” costs aren’t necessarily a negative concept. An hour long meeting with several participants might yield a large dollar amount, but if it was productive and brings focus to the group, then that “cost” becomes a well-made investment. I’m hoping that this can get some use within New Jersey and that others may adapt it and use it for their own meetings. I’m going to follow up this post with a technical explanation of my development and deployment workflow. If you’d like a copy of the code, head over to Github where you can use the code as you see fit. I’m currently down at the MAC URISA 2018 conference in Atlantic City. This year, I conducted a full-day workshop on Spatial SQL. I also presented on using Docker to explore open source GIS offerings. If you’re still around at the conference and interested in what I presented above, let me know and I’d be happy to discuss! If you can’t make it to MAC URISA and are curious about databases and software deployment strategies, feel free to comment here or message me on Twitter. Here are a few articles I’ve read over the last month that you might find interesting. Recreating Hawking’s hardware voice in software. … of a production run of 10,000 transistors for example maybe 2-3 percent were “defective” and he purchased these rejected parts which became the source of the “sizzling” sound in the TR-808. Recreating “defective” transistors to preserve an iconic sound. When reading the copy, the line where the two little pieces of paper met looked like a stroke and was added to the character by mistake. IRL bug makes its way into a digital specification, living on indefinitely. While Gargac did have a small sign on his car that theoretically provided “consent” to “recording,” many passengers did not notice it, and it did not indicate at all that people were being livestreamed. He openly advertised his livestreaming on Twitter. There’s a big difference between what’s legal and what’s ethical. I’m out at the ESRI DevSummit this year, and tonight I presented the following talk on using SQL to perform spatial analysis tasks. The presentation slides are included here. I tried to squeeze in several examples, including mapping 2,199 farms for the State of New Jersey, studying habitat change, and monitoring use of a crowdsourcing application. I also use SQL extensively in NJParcels.com on processing the available public data, as well as to produce the data products available on the site. You might also find my LearnSpatialSQL.com site helpful if you want to learn more about using only SQL for performing GIS tasks. This is third in a series of posts on a side project of mine, NJ Parcels. Read the first and the second parts. In the summer of 2015, we decided to get takeout from a local Greek place. We were apparently not the only folks with the same idea. When I arrived, there was a line outside and all the seats in this small place were occupied. They apologized and told me my order would take about 20 more minutes. So I hopped back in the car and took a short drive around the neighborhoods south of Glassboro. After passing several houses either for sale or just plain interesting from the curb, I realized that I needed an easy way to search my site based on my phone’s current location. The county roads in South Jersey all have variable names, often changing mile by mile. For example, Woodbury Road becomes “Woodbury-Glassboro Road” somewhere between Glassboro and Woodbury, and then eventually changes to Glassboro Road in Woodbury. The numbering resets at one point as well, which makes searching for a specific house difficult at times. This is the second in a series of articles regarding a side project of mine, NJParcels.com. Read the first article here. Read part three here. 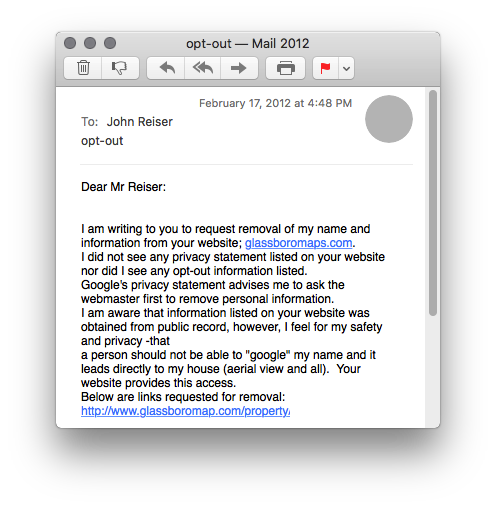 Once GlassboroMap and NJ Parcels started to get considerable traffic, I began receiving emails asking for the owner information to be removed from the site. While this was public data and, I imagine, has always been available, the easy ability for a search by name to bring up this information caused some individuals concern. Having known about assessment and parcel data for a while, I was initially surprised at the level of concern some individuals had about the site. Of the emails received, most were courteous. This is the first in a series of posts about a side project I’ve been developing and maintaining for the past few years. This introduction will be accompanied by subsequent posts dealing with the technical, commitment, and emotional issues associated with running a project on the side. Read part two here. Back in 2009, I moved down to Glassboro, New Jersey to be close to work. I had spent that summer contributing to OpenStreetMap and wanted to spend more time working with local data. In searching for a new home, I wanted to use property information and other points-of-interest data to get (re)acclimated to the area. At the time, I recall web GIS falling into two categories: Google Map mashup or ArcIMS/ArcGIS Server desktop-on-the-web GIS. Typically, the map mashups were tailored to a specific region or data set. The clunky web viewers set up by county and regional governments had valuable data, but an absolutely abysmal user experience. So, in the Summer of 2009, I planned on making a web site with some local GIS data for Gloucester County. I originally planned to pull in information from OSM and other sources to paint a picture of the community, highlighting what would be most useful to someone considering moving to or visiting the area. 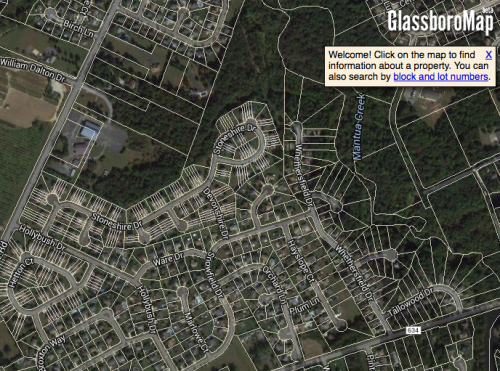 Setting it up on Dreamhost shared hosting, I eventually bought GlassboroMap.com that fall and began building a web map, starting with property information for the County. I have been working on a project that is driven by a series of functions written in PL/pgsql. The functions look at New Jersey’s land use data over several different time periods and selects out certain areas if they have the right mix of land use types and they meet an overall size threshold. The project requires the same selection process with approximately 60 different selection criteria and it operates over 5 different time periods of land use data. An efficient, programmatic approach to the problem is absolutely necessary. Last night, I finished writing up a function to perform another set of steps in this selection process. As land use changes over time, the function creates 5 different sets of polygons based on the five time periods (1986, 1995, 2002, 2007, 2012) to represent the size thresholds the land use data must meet. After selecting the non-compliant areas, the function then marks the underlying land use as “not selected”, using a bitmask which represents selection/rejection for each time period. For example, I need to only include land use polygons where their contiguous area is greater than 50 acres. Individual polygons are going to be smaller than 50 acres, but should be included if they are part of a contiguous fabric of polygons that exceeds that size. Before leaving work, I ran the function against some test data and when I arrived this morning I found the query was still running. It took 7 hours to complete the one step! NOTICE: Patch Size Requirement Constraint Complete. query result with 1 row discarded. The function that was causing the delay was that final update to the base data. Keep in mind this is one of 5 functions for each of the time periods. What was causing it to run so slow? Well, the land use data is a conflation of all five time periods, weighing in at about 2.5 million polygons. I calculated a spatial index on both tables, but clearly that was not enough. Luckily, this data also has a region identifier. The land use data was split up into about 8,000 regions, each with its own unique region identifier. As the “patch” data was generated from the same land use, we could include the region identifier in that as well to help optimize the query. It was safe to use the region id, as no two polygons with different region ids would touch and be contiguous. I also realized I was missing a step I used elsewhere in this project. The double-ampersand (&&) operator performs a minimum-bounding rectangle comparison between the two geometries. This operation can also be performed using only the spatial index. So I added it as well in the hopes that it would improve the results. Running the function again, the process now only takes about 15 minutes, which is approximately 28 times faster than before. No longer are we relying on a Heap Scan, instead we use the spatial index, with both the text comparison and the more thorough ST_Intersects() to validate the results returned from the Index Scan. I’m still amazed that the query planner (this is on PostgreSQL 9.3.9 with PostGIS 2.1.7) doesn’t use the MBR/Index Scan when comparing features using ST_Intersects. It’s always good to run EXPLAIN against your queries and test them in isolation. Just because you generated an index, doesn’t mean the database is actually using it. And it might seem redundant to type a.shape && b.shape AND ST_Intersects(a.shape, b.shape), but I’m happy to do it if it saves hours of time waiting for tasks to complete. Map of Land Use Categories by County. From the Tableau dashboard. I was home sick on Wednesday, so while I was on the couch I decided to dive into Tableau Public, a free desktop visualization tool. At IERP, we use Tableau for some of our public dashboards. Other than some minor playing around, I really did not use tool too much prior to this. It’s really great for working with complex data and seeing results quickly. Seeing that the 2012 Land Use data was released a few weeks ago, I wanted to see if I could bring it into PostgreSQL and produce some graphics of how the land use has changed over time. View the Tableau Dashboard, the code to reproduce the data, and read on. Where the “muncode” is the 4 digit identifier for New Jersey municipalities published by the Division of Taxation, and the “block” and “lot” are the local level parcel identifiers. So each directory reflects essentially the spatial distribution of properties – lots will be near to other lots within the same block or municipal folder. I recently wanted to see how each town was performing in terms of page views. 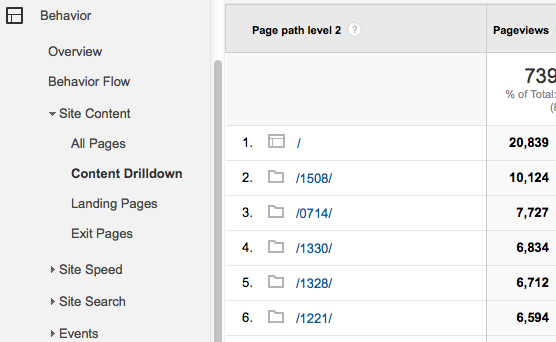 Now, I can see such a report using the Content Drilldown in Google Analytics, but I really did not want to write something substantial to get at the information programmatically for further analysis. Content Drilldown is available through the API, so I could write something that authenticates against the API, performs the queries and stores the results, but that would be overkill, considering I also have the access log from Apache at my disposal. I was able to make a report similar to what is on Google Analytics by using several Unix tools. Here’s what I did in one line to get the same type of information. First, grep (globally search with regular expressions and print) will take in a file – in this case, “access_log” – and return only the portion of each line that matches the regular expression “/property/\d+“. The significant portion of that is the \d+ which means match one or more digits. Normally, grep returns the entire line when there is a match. The -oP are two flags to say only return the match and use Perl regular expressions. 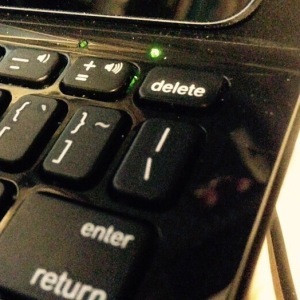 If you’re not familiar with Unix, you may have once looked at your keyboard and thought, “what’s that vertical line and when would I ever need it?” The vertical line is often referred to as the “pipe” character, as it signifies that the output of one Unix tool should be passed (or piped) into the next tool written on the command line. With this, we can channel the results of a tool into the next tool for further processing. The pipe character persists, even on an iPad keyboard. We pipe the output of grep (a list of all second-order directories accessed by visitors) into sort. sort does what is sounds like, sorting each line returned alphabetically. We sort the output of grep to use the next tool to give us our count, uniq. uniq collapses duplicate lines into one and can also provide a count of lines collapsed (using -c). In order for uniq to work properly, we need to sort the file first. r and n flags, which reverse the order and sort numerically instead of alphabetically, allowing me to see the most-visited municipalities at the top of my output. I can further process these results, using other tools like awk and sed to perform other tasks, such as reformatting to CSV for loading into a database. The Unix philosophy has always been in the back of my mind when working with Desktop GIS. The UIs are always so busy and complex that you often struggle with knowing what tool to use but being unable to find it. Or be stuck with the point-and-click mentality, where the tools expect human intervention in order to work. While concepts like ModelBuilder in ArcGIS Desktop are a step in the right direction, it still leaves much to be desired. Don’t get me wrong, I’m not suggesting we go back to AML, but we should put more thought into the tools that are available to us and use the ones that are best for the job. While I’m most at home programming in Python and could easily have written something in the language to parse the file and tally the results, it was ultimately much quicker to briefly experiment with existing tools and come up with a solution. The right tools aren’t always the familiar ones, but you might become more familiar with them with some experimentation.